Home Blog Which Garage Door Should I Choose? 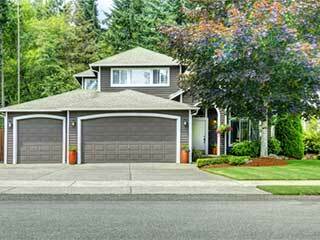 Few homeowners pay much attention to their garage door. As long as it continues to work day after day, they’re happy. However, more and more homeowners are beginning to see the potential of investing in a door that’s more than just a functional way to get in and out of your house. The number of homes now sporting stylish, more functional doors is on the rise. The traditional attitude towards garage doors has always been “as long as it works, who cares what it looks like”. However, this attitude jars with the way many homeowners look after their properties - if you’re proud of the way your home looks, why would you settle for an ugly door? This question is being asked more and more and homeowners are discovering that in fact they don’t have to settle for a plain, standard door at all. What garage doors are on offer? Homeowners have a wide range of choices available to them, in almost every conceivable material. Just as with interior decoration, you’ll want to choose a scheme that suits your home and generates that all-important “curb appeal”. One of our favorites is the Clopay Canyon Ridge series of doors, which use clever faux-wood effects to simulate old-fashioned carriage doors. However, while they might look rustic and traditional, they’re packed full of modern technology - a composite steel core and cladding overlay provides strength and insulation as well as great looks. On the opposite end of the spectrum, Amarr’s Horizon doors give homeowners top-quality cutting-edge modernity in a sleek package. This striking door range features glazed glass panels set into an attractive steel frame giving any home a distinctive edge; creative types will be thrilled with the amount of customization on offer here - the door’s glass panels can be tinted with any color you want, and are available in a wide range of frosted, snow, and clear glass variants. At Garage Door Repair Lake Zurich, we believe that a garage door should be chosen as part of your home’s design, not only as a functional piece of equipment. With the enormous amount of variety of the market, it can be overwhelming trying to find a door that suits you. We're always happy to help you select a door that truly works for you – we also offer professional installation and maintenance services. Talk to us today!